Enjoy the classic taste s’mores treats anytime – anywhere, even without a campfire. These bars feature bites of chocolate cheese fudge. Take them along to your next party, and you will bring home an empty pan. Guaranteed! Look for the Proudly Wisconsin Badge when shopping for cheese. Any brand of Wisconsin Chocolate Cheese Fudge can be used in this recipe. Heat oven to 350˚F. Line an 8-inch square baking pan with parchment paper, allowing excess paper to hang over sides. Set aside. Beat butter and sugars in a large bowl until crumbly. Add egg and vanilla; mix well. Combine flour and baking powder; gradually add to butter mixture until blended. Stir in cracker crumbs. Press half of the dough onto bottom of prepared pan. Lift parchment out of pan; place dough in refrigerator. Press remaining dough onto bottom of a parchment-lined or greased 8-inch square baking pan. 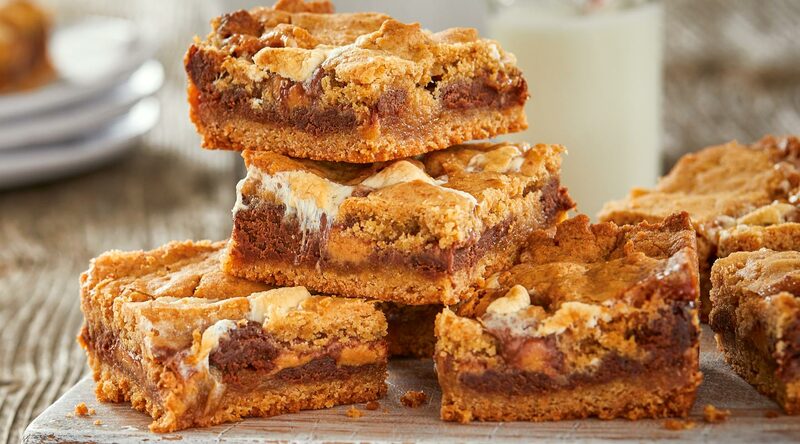 Sprinkle with cheese fudge, marshmallows and peanut butter cups. Break refrigerated cookie dough into large pieces; arrange over top. Bake for 23-27 minutes or until golden brown. Cool complete on a wire rack. Cut into bars. This fudge is rich and creamy! Starting with the finest ingredients, Kelly’s Kitchen Chocolate Cheese Fudge is made with locally sourced havarti cheese, cocoa, sugar and cream. Fun to try it in a dessert, or serve it sided with fresh berries, shortbread cookies and nuts.